Oldham Athletic are in talks with former Manchester United and England midfielder Paul Scholes regarding their vacant manager role. The League Two Latics are looking to appoint a successor to Frankie Bunn, who was sacked on 27 December. Scholes, 44, has a lifelong affinity with the club and attended Saturday's 2-1 defeat by Macclesfield Town. Since retiring in 2013, he has not managed in the English Football League (EFL). Academy boss Pete Wild has been in caretaker charge at Boundary Park. If Scholes is appointed, under EFL rules he may have to relinquish his position as co-owner of Salford City, who are third in the National League and chasing promotion to League Two. EFL regulation 104 states: "Except with the prior written consent of the board, a person who is interested in a club cannot at the same time be interested in any other football club." Scholes was part of the five-strong Manchester United Class of '92 to buy a controlling stake in Salford in 2014 when they were in the Northern Premier League first division, and was briefly joint caretaker manager, with Phil Neville, in 2015. That, along with a short spell on the United coaching staff when Ryan Giggs took temporary charge following David Moyes' sacking in 2014, remains his only experience in the dugout. 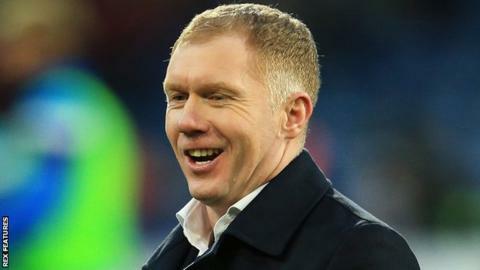 Scholes told BBC Radio Manchester he was interviewed previously for the Oldham job, when former boss Richie Wellens was appointed in October 2017. Oldham dismissed Bunn last month following their 6-0 defeat by Carlisle United. He had only been appointed last summer. Since then, under caretaker boss Wild, they have won two of their four league games and stunned Premier League side Fulham in the FA Cup third round. Scholes made 718 appearances for Manchester United, including 499 in the Premier League, and scored 155 goals for the Old Trafford club.